Online retail giant Amazon is to create 500 permanent jobs at a new site in Doncaster. The fulfillment centre, to be based at the iPort site in Rossington, will comprise 6million sq ft of warehouses handling shipping containers arriving on trains from all major UK ports and the Channel Tunnel. 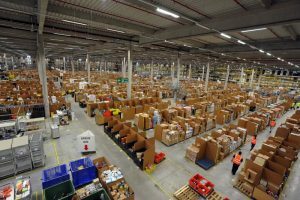 It will be Amazon's third fulfillment centre in Doncaster, after a centre in Balby Carr Bank opened in 2010 and a second in Water Vole Way opened last autumn. John Tagawa, Amazon’s Vice President of UK Operations, said: “We are delighted to announce that we will be creating 500 new permanent full-time jobs with competitive pay and comprehensive benefits starting on day one by opening our third fulfilment centre in Doncaster in summer 2017. "We already have two fulfilment centres in Doncaster so know from experience that there is strong talent in the region who would be well suited to working for Amazon. The new centre is expected to open next summer.